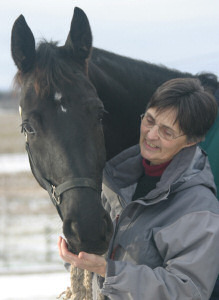 My name is Doris Kay Halstead and I'm the author of Release the Potential, Symmetry in Motion, and other books about horse symmetry and movement. As a rider myself I can appreciate the search that Americans go through to find someone knowledgeable in the area of correct horse movement and carriage. In my search, I have ridden with Walter Zettl (author of Circle of Trust: Reflections on the Essence of Horses and Horsemanship ), Hilda Guerney, Sam Bachelor (former head rider of the America Lipizzaner Troup), Carel Eijkenaar, Molly Sivewright and many others. My background includes years of leading 4-H horse clubs and coaching the horse bowl group to state competitions and writing the syllabus for New York State's teaching program for horses in the agriculture classes. I have been certified to the highest level of Certified Horsemanship Association testing in English, Western and Handicapped riding. I have attended (twice) the Violet M Hopkins: National Dressage Symposium, with Colonel Aage Sommers of Denmark, Major Anders Lindgren of Sweden as instructors with Bill Woods, Sally Swift, Gunnar Ostargaard and many others assisting at the time. I have participated in clinic with Linda Tellington Jones, Michael B. Richardson, Bruce Morine, Paul St John, Feldenkrais practitioners, John Barnes MFR seminars (to the highest level at the time), N.D.T. neural-developmental training seminars and many others. My business of working with horses and riders is called Release the Potential. I worked in my profession as a Physical Therapist full time until 1996 and owned a horse boarding operation in Cuba, N.Y. from 1977 to 2001. During this time a gift horse, Duster, started my journey in Release the Potential for horses and riders. He and his many problems taught me the basics of releases that made huge differences. In January 1996 I started traveling across America working with horses and riders, and attending horse shows. This made me realize how many horses have body pain and movement problems due to incorrect training techniques. I have come to realize how much incorrect handling and training of horses there is in this country for we have few truly knowledgeable people, compared to numbers of people involved with horses, in this field. This is particularly true when horses are required to perform at fairly high levels, no matter what the discipline. Therefore, Release the Potential was spawned. Having published the second edition, I am now working on a sequel, Release the Potential of the Rider. The new works include all of the ancillary techniques that assist in a full release of restrictions plus energy work, re-toning, and re-training. Evaluating the problems that need correction has also been expanded for the rider and/or owner to see where to touch their horse to help them. The techniques are fully presented with loads of pictures and are non-threatening and non invasive to the horse so anyone can safely try them and do no harm. Even if the horse does not change, he has had good bonding time with a friend. Establish new habits to counter your asymmetries. Retrain movement patterns with non threatening, non familiar and small movements. Very few people realize how many avoidance movement patterns we have made for ourselves over the years and this is the primary reason for fatigue and joint pain. The good thing is that the ways to help the most accomplished and the average person are identical. I have written many articles concerning training and muscular development of the horse for Dressage and CT magazine, Chronicle of the Horse and more recently, an article in the appendix of Walter Zettl's book Circle of Trust; published by Half Halt Press. I send the best to all of my readers in prospects for a smooth comfortable ride for both you AND your horse.